The widow of Chandan Pradhan whose dead body was found on 30th December at sevoke is asking for justice over the death of her husband. Chandan Pradhan a contractor by profession was travelling with two of his friend Deepak Agarwal and Prem Puniya on the day of incident. His body was recovered from a 300ft gorge near Coronation Bridge on NH31 in Kalimpong on 30th December. He was returning back to home with his two friends but it was said they were engaged in some scuffle with some bikers but later police arrested both of his friend on suspicion. Today the widow with Reeseka Chhetri , National Secretary of International Human Rights and crime control organization meet Kalimpong SP Ajeet Singh Yadav seeking justice. After the meeting addressing a press meet widow Bijeta Chhetri Pradhan crying said “ My husband was brutally killed by Deepak Agarwal and Prem Puniya she alleged. They were arrested but within a month they were out on bail and are roaming openly. From last five month we are seeking for justice. We had only one male member who was hacked to death. My 10 years old daughter is always crying remembering her dad.He said Prem Puniya called him on 28th December he stay at siliguri that night and on 29th December evening he said he was returning but he never returned. She added that we being alone done not went to any political party as we had belief that we will get justice. We visited Darjeeling SP who gave us a three month time but later Kalimpong being a district SP said it will be seen by new district. 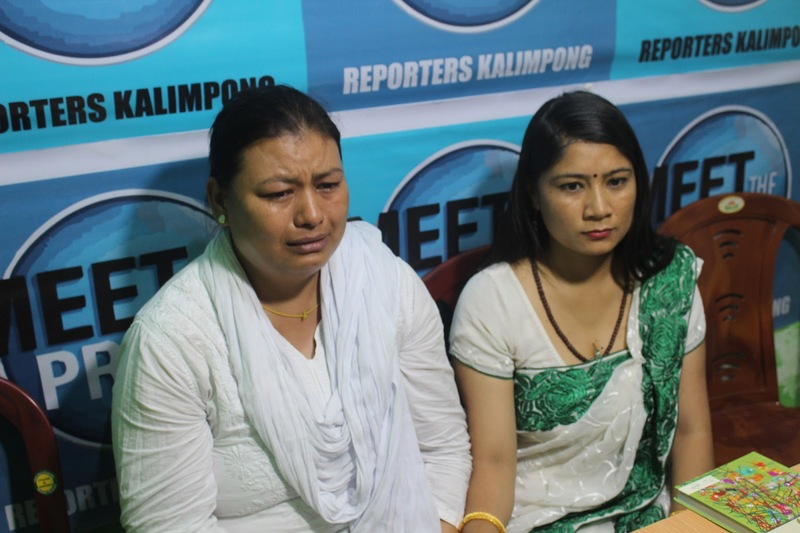 Reseeka Chhetri National Secretary of International Human Rights and crime control organization said a case came yesterday at our office. Bijeta informed about her case and seeking all the detail we today met SP Kalimpong who has assured us give justice in a month time. She said we will be moving to Kolkataa High court for cancelation of bail plea soon. 0 Respones to "Widow seeks justice over husband's murder"